What’s New In Flooring? 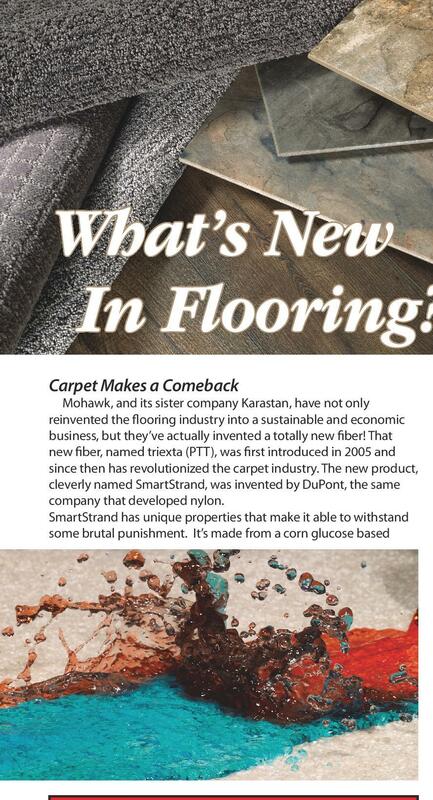 Carpet Makes a Comeback Mohawk, and its sister company Karastan, have not only reinvented the flooring industry into a sustainable and economic business, but they’ve actually invented a totally new fiber! That new fiber, named triexta (PTT), was first introduced in 2005 and since then has revolutionized the carpet industry. The new product, cleverly named SmartStrand, was invented by DuPont, the same company that developed nylon. SmartStrand has unique properties that make it able to withstand some brutal punishment. It’s made from a corn glucose based Whether you’ve put new floors in before, or you are walking into a flooring showroom for the first time we want to help you understand the latest and greatest innovations out there so you can make the best decision possible for your home or business when it comes to purchasing new floors. Here are the top new innovations in flooring! product that is renewably sourced and environmentally safe. It’s produced with a natural spring in the fiber making it resistant to crushing and matting and has built in stain and soil protection making it the perfect carpet for families with kids and pets. Tile and Technology Whether porcelain or ceramic, tile design has improved dramatically – bringing sharper and more realistic images into the tile-making process. New textile patterns are now possible with advancements in 3D and digital printing techniques. There are a multitude of patterns, glazes, and textures to choose from. Becoming more popular are the large floor tiles which can range in size up to 48 in X 48 in. Love of Laminates If your walls could talk, they’d thank you Great Home Insurance Protect your home with the best. And do it at a price that will have your wallet saying “thanks” too. 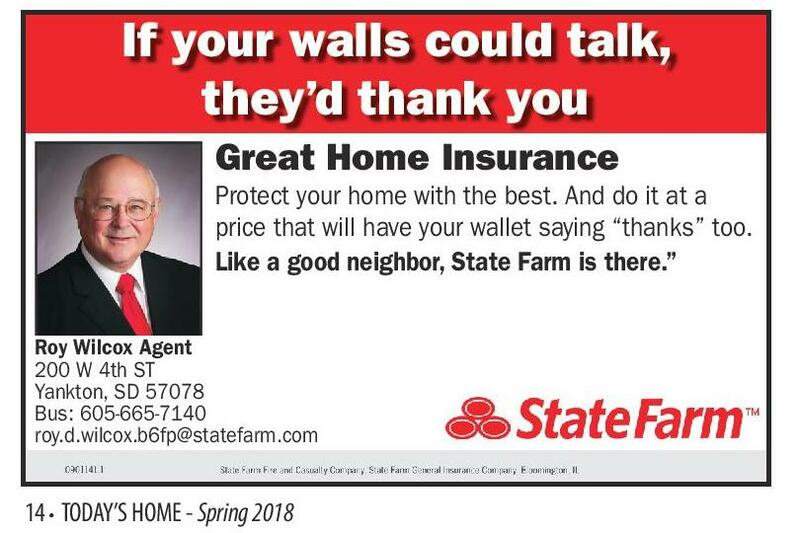 Like a good neighbor, State Farm is there.” Roy Wilcox Agent 200 W 4th ST Yankton, SD 57078 Bus: 605-665-7140 roy.d.wilcox.b6fp@statefarm.com 14 • TODAY’S HOME - Spring 2018 Similarly, laminate products are becoming more realistic looking with more textures and a variety of colors options. They also offer resistance to scuffs and scratches meaning they can be installed in areas where there is heavy traffic. Floors typically have a clickin system that allows for easy installation and pre-attached pad for added sound dampening and air flow underneath. Vinyl Advancements Unlike laminate, vinyl is inherently waterproof, making it a good choice for kitchens, laundry rooms and bathrooms. New advancements allow for it to closely resemble ceramic, stained concrete and wood. Lots of vinyl products also employ the clicklock system which allows for easy installation and requires no glue.